I'm thinking continually about jewelry value and how to make the most of what's in our wardrobes. Le Duc gave me a heavy gold chain years ago; lately, since I no longer dress in business attire, it felt formal. To change the mood and use a lustrous 14mm freshwater pearl just longing to be worn, I decided to reno. 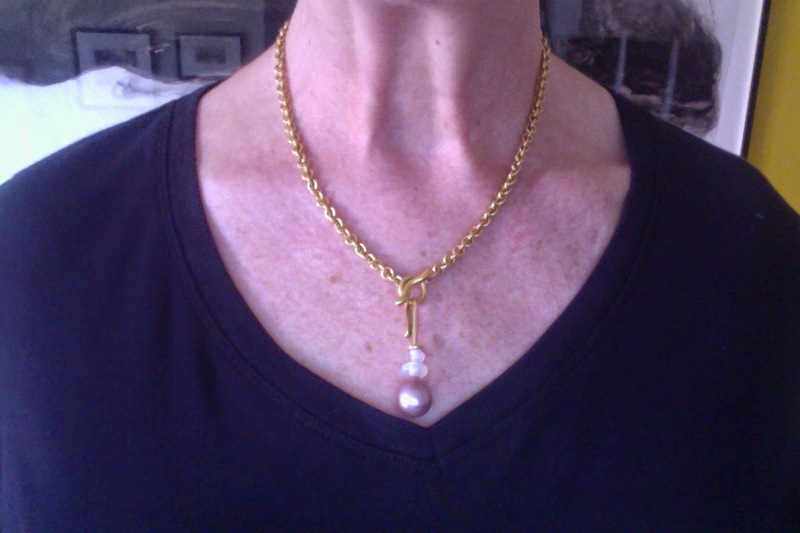 The jeweler, Pam Chandler, sent me a shot of the pearl without the pin attached, wanting to know what I thought. It did not raise my pulse: just too plain. I asked for a more detail and (I think) mentioned India. Pam added faceted Sri Lankan moonstones to add interest without competing with that pearl. I was happy, and within budget. My friend Kate, who has a similar chain, showed me another way to dress it down. One day, she was sifting through her jewelry box and found a ca. 1900 pin of her grandmother's. She pinned it to the chain, and voilà, a pendant. Kate attached the pin through one link, but it's not necessary; you need a vertically-oriented pin sturdy enough not to strain when closed over the chain or a horizontal pin that is fine enough to thread through two or more links. If scouting a new piece, look for a vintage pendant (or pin that can double as one); a little apparent age is part of the nostalgia, but make sure the pin or hook is secure. 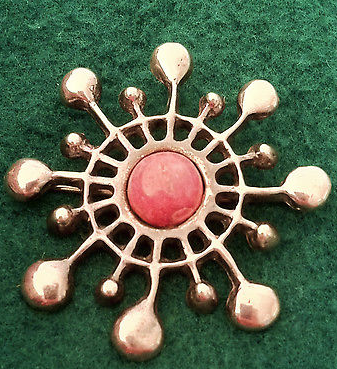 I'm smitten by an Edwardian flower pin, with its gentle patina and whimsey; price, $22 from Etsy seller Glasscreekstuio. But we could go more modern, too. Here's a David-Anderson "snow crystal" brooch that coverts to a pendant, set with a native, rose-coloured Norwegian mineral, thulite, named for the mystical isle of Thule. BIN price on eBay was $199 and though it may be sold by now, I wanted to show this honey! A vintage pendant makes a distinctive layering piece, and evokes a time when workmanship was several notches higher. Though I am showing pieces from online vendors, readers have scored treasures at vintage shops, church rummage sales or thrifts. Keep your eyes open, stash a few twenties for the right moment, and tell us what you find! What good ideas! I'm camping on a really nice gold chain that I've worn since the 80's, when they were SO essential. Now I'm going to dig through my vintage brooches and come up with something wonderful - thanks, as always! 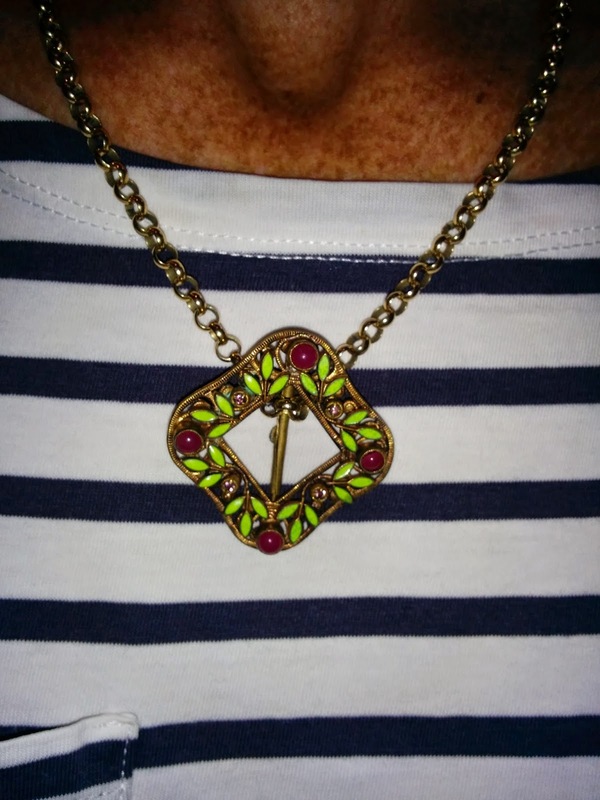 My grandmother always wore her broaches with a chain necklace! I haven't seen that for years, but she was very chic and I can still see her simple dresses with a gold chain and a broach. She always left the chain a bit loose. Great ideas! I think the "drop" on a pin, brooch or pendant is also a nice way to add some visual length to a necklace that now feels just a bit too short. Thanks for mentioning the clasp idea, that's a great "in a pinch" solution, too! It would be working backwards (and it's also budget-prohibitive), but this post tempts me to get a gold chain. . .
You've had me thinking like mad about ring refashioning from several outdated jewelry items. 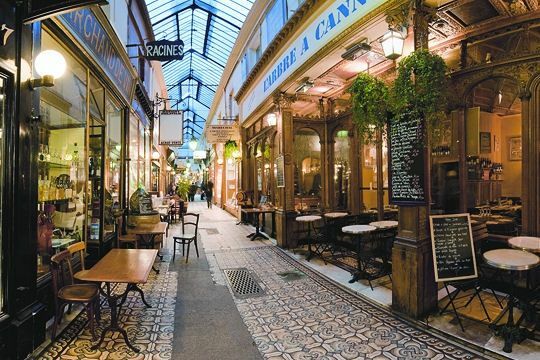 This idea is wonderful since there's no major commitment (melting and redesigning!) but a great new look. I love that chain, and the pearl you'll now be wearing with it. I've been nattering on about renovating some jewelry for how many years? Now that I have the time and imagination capacity for it, I am much lower on funds:(. I own a delicate gold chain so like mater I would need to invest in a bigger link so that it would be sturdy enough to hold a brooch. I have quite a few pins that would work though! I love the David Anderson designs....Modernist jewelry is a fun way to add oomph to a basic outfit. A fun post today which inspires me to rethink what is in my jewel box. I have done this with a strand of faux pearls. I was able to attach a pendant to the small clasp worn in the front. I love what you have done with the chain. Janice: And we would love to see what you come up with! Anon: Do you mean loose around her neck, versus as a choker? une femme: Jet lag ;) ! The pin made into a clasp requires professional re-styling. (Even a single earring can be made into a clasp), but Kate's idea needs no jeweler. materfamilias: A good chain (in any material) is a foundational piece for a jewelry wardrobe as it's so versatile, can layer or be worn on its own. Jane M: Thanks; there are not many ideas that are so easily DIY. LPC: You need not spend a lot; just like your house decorating projects, there are various price points, and the end result is well worth it. hostess: Yes, many women have those fine chains. I gave several to my jeweler and was delighted at the price they brought. Kristien62: Yes, I have done this with pearls too, but with 'everyday' versus the bigger-deal ones as some pins can abrade. I am enjoying this fun post and all the comments! I am very interested in vintage pins and am always looking for new ways to wear them. I have worn them with pearls but the chain has got me thinking....materfamilias has the right idea. In answer to your question about how my grandmother wore her chain/brooch combination, she wore a gold chain (not thin, not thick). It was longer than a choker, maybe opera length. She then pinned her broach on her dress, 'catching' the chain through the pin. The chain was not taut, made looser by the pinning, which raised it a bit. 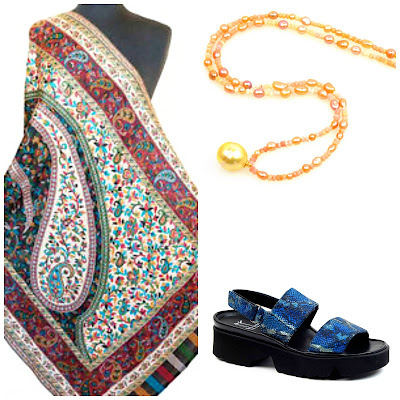 I once asked her why she wore this combination and she said as a guard against loosing the brooches. They were all amazing...diamonds etc. Perhaps it was just to make sure not to loose the brooch, but it was her signature look to me. Anon@ 7:05: Thanks for the clarification, I can 'see' it now. Anon@ 1:08: Similar pieces-both are vintage sterling silver of nearly same size; slightly different centre stones. The John Lewis brooch is priced much higher, $525. As of this moment, the eBay piece is still available for BIN price of $199. 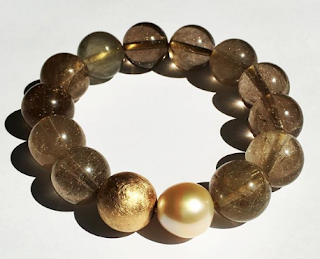 Women over 50 look best in genuine pearls and can find pieces at prices similar to that of some of the costume stuff shown in that slide show- or it's worth saving for. Thanks for sending us the link; it's fun to see what's out there. I have a nice little collection of vintage (costume) brooches from my mother & granny. Most are quite sparkly, which is fine with me. I keep reminding myself to find more ways to wear them; after an informative blog post (maybe here, don't recall) I pulled them all out & examined the backs, and found that two had loops on the back so they could be worn as pendants. I am now going to have to incorporate a brooch in tomorrow's outfit! 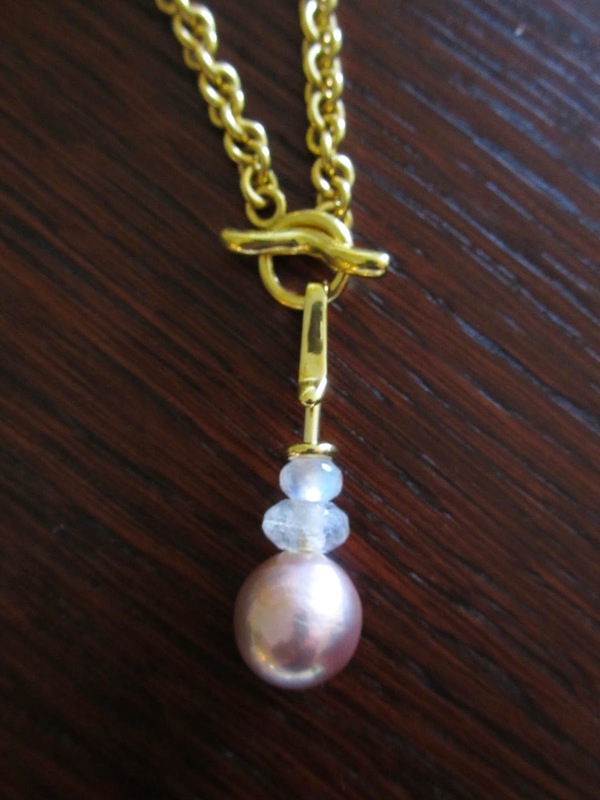 The pearl/moonstone on the gold chain is beautiful. I like the idea of a brooch worn on a chain. 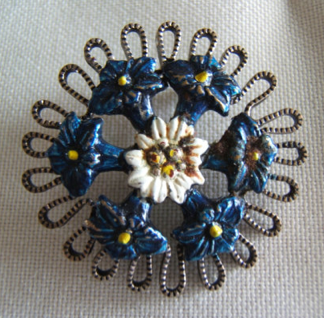 I collect brooches that have the tiny Italian glass mosaic patterns. 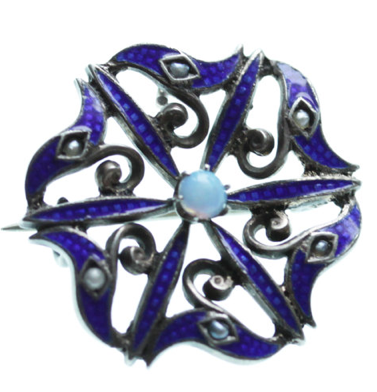 I have one of those brooches in mind to try on a chain. Thanks for the inspiration!